Members of JHDJ Law spearheaded a joint effort with the Indiana State Bar Association’s Women in the Law Committee inaugural entitled “Lady Justice” on Saturday, March 26. The event was an educational program for the Girl Scouts of Central Indiana and took place at Indiana University School of Law – Indianapolis with the help of 15 volunteer attorneys and judges. Scouts completed projects, listened to a panel discussion, shared lunch and watched a mock trial. 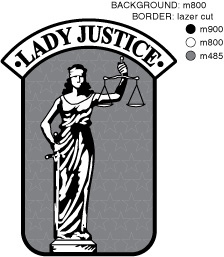 Their participation will culminate in the Scouts earning a “Lady Justice” badge. One of the projects combined jewelry-making with a lesson in civil rights. Each bead used to make a bracelet represented a civil right, such as the right to counsel in criminal matters. The second activity focused on setting goals and making smart decisions, and involved the Scouts drawing pictures of themselves at age 15, 25, and 50. During this activity, the volunteer attorneys and judges explained to the girls how to prepare for college and a career in law. The panel discussion offered an opportunity for the attorneys to share their perspectives on being a female in a male-dominated career field. Marion Superior Court Judge Cynthia Ayers shared her experience of becoming a judge and the Scouts were encouraged to ask questions about the challenges of a legal career. After lunch with the volunteers, the Scouts witnessed a mock trial for the Big Bad Wolf. The script for the mock trial was written by Jocham Harden Dimick Jackson attorney/mediator, Holly Wanzer, who is also a Girl Scout troop leader. Another member of JHDJ Law, Clarissa Finnell also volunteered. Organizers of the event noted that the firm’s founding partner, attorney/mediator Stephenie Jocham, originally suggested the idea of creating the event. Volunteers pointed out that while the event focused on fun activities, the subject matter was taken seriously and respectfully. Organizers suggested that the event could be replicated for Girl Scouts troops throughout Indiana and the country. Organizers worked closely with Girl Scouts administration to make sure qualifications merited a badge. While the Lady Justice program is not the only law-related badge for Girl Scouts, it is the only one geared toward female-centric issues in the law and designed to encourage careers in the legal field.